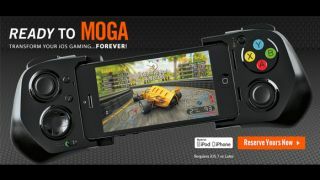 The lives of iOS 7 gamers are about to get a whole lot easier as mobile gaming peripheral maker Moga has debuted what it claims is the first gamepad compatible with Apple's latest OS. The Moga Ace Power controller attachment for iPhones and iPods is "coming soon," according to a sign-up page on Moga's website, and will debut for $100 (about £62, AU$106). The Ace Power for iOS 7 lets users slide iPhones and iPods with lightning charger inputs (that includes the iPhone 5, iPhone 5C, iPhone 5S, and 5th-gen iPod Touch) between its two sides, which then snap into place around the device. It features an analog nub on either side (they look similar to the Nintendo 3DS's), plus a d-pad on the left, four face buttons on the right, two shoulder buttons, and two triggers. Moga debuted in 2012 with Android gaming accessories like the Moga Pro controller for Android. Like the company's Android accessories, the Ace Power will need support from developers to be truly useful. But mobile game devs have little reason to develop for physical gamepads that aren't widely adopted, so such support is usually spotty. Moga's Ace Power iOS 7 gamepad also features an 1800 mAh battery that helps charge newer iPhones and iPods and prevents frequent gaming from draining device batteries. The Ace Power first popped up last month when Twitter tipster @evleaks tweeted a photo of it along with a few details. That tipped us off to the battery in the gamepad, though the final product looks a bit different from what was seen then. In fact, the @evleaks photo now looks like it may have been a concept shot or prototype image. Expect more on the Moga Ace Power iOS 7 game controller soon. Don't miss TechRadar's 21 brilliant iOS 7 tips and tricks.